I promised in the earlier beach post I’d recommend some places for those of you who are “Pissed up Brit tourist” intolerant. Barceloneta beach does, despite the air of bawbaggery that surrounds it, have its place but I accept you have to be in a certain frame of mind to enjoy it. For those of you who want something less “full on” or if you don’t smoke industrial quantities of weed there are plenty of options. To the north of Barceloneta beach, past Port Olympic there are a number of separate beach areas, as you move further north the greater the likelihood of avoiding shaven heided fatties in union jack shorts. On all of these beaches you’ll find beach bars but if this sort of beach is more to your liking I recommend going down the “Cool box” route even more. From Bogatell north there is little in the way of nearby shops so take your supplies if you don’t want to pay the beach bar prices. For fans of soft furnishings and chintz throws the Mar Bella beach is very “good with colours” friendly and, as with Barceloneta beach it is situated next to the “open air, flange and todger” section of the beach. For those who want to get out of town for the day then there are a number of options both to the north and south of the city. Castelldelfells and Sitges to the south would be my suggestions, you’ll be on a train for 30 and 45 minutes, respectively but well worth the journey. In addition to a day on the beach there is the option of having a bit of a wander round and a bite to eat in either town. 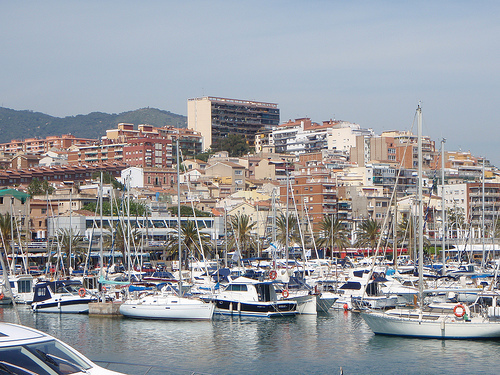 El Masnou is a good shout, not too far out, relatively quiet and bampot-free beach, nice marina and is well served with restaurants and bars. If you are here in the football season and want to watch a game there is a Scottish Pub, The Bracken on the marina strip where you’ll get a pint and the live Sky game. The owner is a surprisingly welcoming despite the fact he plays rugby. For other rugby fans the council ordered the bar to stop serving piss and aftershave shandies I’m afraid to report. This entry was posted in Beach life. Bookmark the permalink. Cheers for the info and for the rest of our blog. I’m visiting Barca next month, staying in Poblenou. Where’s the nearest/best beach to there? Good stuff. Didn’t expect to get a curry!! Any other recommendations for that area would be appreciated.